Many students who have ADD or ADHD also have executive function gaps. Organizing, keeping track of schedules and details, and managing time can feel overwhelming. That’s why creating a consistent home routine is vital. Keeping in mind that outside schedules may change week to week (sports games, play rehearsals, work commitments), it can be a game changer for students to have a regular routine both in the morning and when coming home. For those who haven’t had a home routine, it can take time to change. Try starting with one piece at a time: for instance, you could start with always gathering up important items for school before bed. Once that becomes routine, add another piece. As much as possible, have your child do things in the same order. For instance, shower, get dressed, brush teeth, gather materials for school (backpack, coat, homework), eat breakfast, and go. This will depend on what works better for your child. If they are sharper after school, this is a good time for homework. If they need some down time or a snack before tackling homework, build that in. Observe your child and see what works best for them. 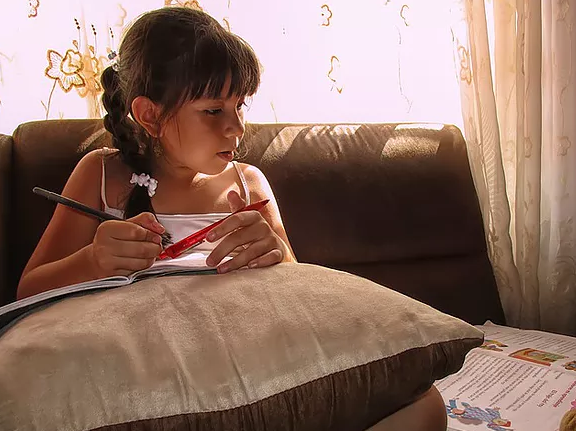 Homework can be a huge source of struggle with ADD/ADHD students, so minimizing distractions and allowing them to be in the best space, physically and mentally, is important. Five minutes of family mindfulness could be a good transition from school to homework or other activities. This is perhaps time for more homework, or a chance for your child to read, play a video game, watch a show, make art, or just chill. Helping them go to bed at a consistent time will ensure a better night’s sleep which leads to a more productive day the following day. About Homework Some students with ADD/ADHD need additional support around homework. On days when your student isn’t working with me, check in to see what they have on their plate and ask if they need any help. Look at the school’s online portal, if applicable, to check that they are aware of all of their homework assignments. And most importantly, help them make sure their homework gets from their desk/the kitchen table into their backpack. At first, you may need to do these things every day, as ADD/ADHD students often need a lot of support, but eventually they will start to make this a habit on their own. Homes that have a different schedule every day can be highly challenging for students with ADD/ADHD. If this is the case in your home, consider creating a consistent routine on as many days as possible. Or, if changing schedules are your norm, make sure you create supports for your student, such as a wall schedule posted in his or her room and a common room that your child can view to keep track of what is happening when.